As cryptocurrency valuations skyrocket, one Denver company is seeing growth as well. Ideas By Nature, which assists blockchain companies in both creative and technical projects, recently leased nearly 7,000 square feet at 1875 Lawrence St. in LoDo. Business development director Jeff Vier said the company outgrew its previous 2,000-square-foot office at 1009 Grant St. earlier this year. Viet started the company has 26 employees, up from 15 at the start of 2017. “Our plan in 2018 is probably to have somewhere around double that number, anywhere between 40 and 60 employees,” he said. Ideas By Nature was founded seven years ago by Phil Cowan and Jon Shapiro as a web development company, helping entrepreneurs make apps. 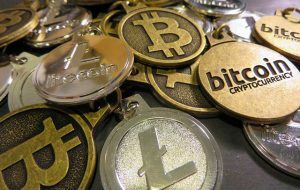 But four years ago, the company made the jump to blockchain, the network that keeps track of digital asset transactions and digital asset trades through cryptography. Now, Ideas By Nature helps cryptocurrency companies create an identity. The company helped cryptocurrency and blockchain news site CoinDesk with its rebrand, including new web and mobile design. On the other end of the spectrum, Ideas By Nature helps clients with mobile and website design that interacts with blockchain technology, but is still easy to use. Dash, another cryptocurrency, hired Ideas By Nature to develop new applications and other projects. Public interest in cryptocurrency has surged in recent weeks. The price of a single bitcoin, the most well-known cryptocurrency, topped the $10,000 mark in October, up about 900 percent compared to the start of 2017. Vier said Ideas By Nature sponsors the Ethereum Denver monthly meetup, which 300 attendees at the most recent event. Ideas By Nature isn’t the only new tenant at 1875 Lawrence St.
Salt Lending, a tech startup that lets users offer digital assets as collateral to secure cash loans, also leased 6,785 square feet in the building. Jonathan Tilton with Newmark Knight Frank represented both companies.